There’s little need to step inside of a crowded mall this season. Frisco boasts of many small businesses, unique finds and memorable experiences that are sure to bring Christmas cheer to the ones you love. With Frisco’s rapid growth and development, it would be impossible to provide a comprehensive list of gift ideas, but we’ll share with you some of our Frisco favorites to get your gifting juices flowing! What do you get for the person who has everything? For homes that are bursting at the seams with toys, or for those gift recipients who seem to have it all, experience gifts are the way to go. Check out our previously published directory of experience gift ideas that include iFly indoor skydiving, the Frisco Museum Pass, Countdown2Escape, and many others. Dubbed Sports City U.S.A., Frisco is home to SEVEN sports teams! Baseball, soccer, lacrosse, basketball, hockey, arena football and a little place known as Dallas Cowboys World Headquarters. Consider gifting game tickets, merchandise or a VIP box experience for the sports fan in your life. Rally House Frisco: The official locker room store of the Dallas Stars, Rally House is your go-to destination to support your favorite Texas teams. Shop the widest selection of Texas Longhorn shirts, TTU Red Raiders drinkware, TCU dorm decor, Dallas Cowboys tailgate gear, and Dallas Stars apparel for the whole family! They also offer jersey customization, Dallas apparel, and Texas accessories. If the one you’re shopping for has an appreciation for fine art, theater, dance or music, consider purchasing event tickets, a private music lesson, acting lessons or even a commissioned work of art. Frisco Fine Art: This new hip gallery and design studio opened in historic downtown Frisco in the fall of 2017. Offering a “world class roster” of artists in their Gallery from local to International, custom and commissioned works are available as well. They have Art Glass and Sculpture Collections, and many classes and workshop, such as Vino Meets Van Gogh, and the Pajama Party Kidfest. Frisco Youth Theater and Theatre Frisco both offer productions throughout the year, a gift any aspiring thespian would appreciate. School of Rock and Frisco School of Music and Performing Arts each offer music lessons, classes and camps for a variety of ages. What fun it would be for the giftee in your life to have the opportunity to express themselves through performing arts! You can really wow the one you love with a thoughtful gift which demonstrates that you’ve been listening! Maybe your media room could use an update? Or perhaps a session with a professional home organizer would bring your loved one some much-needed relief and support. DeVance Electronic Lifestyles: Enhance your loved one’s lifestyle with Smart Home Technology. Simple, yet sophisticated control of music, video, lights, climate and more. Industrial Cigars: They cut the ribbon last weekend and are officially open for business in Frisco! Industrial Cigars offers a welcoming environment to buy, smoke and store cigars, and memberships which allow for private lockers, lounge rooms, and exclusive product offerings. Decluttered Spaces: Give your loved one the gift of an organized space! Owner Nicole Lynn rolls up her sleeves and gets things in order. A session with Nicole begins at just $60 and will get the ball rolling toward a more organized 2018. Jungle Joes: The “cafe where your kids can play” can make your loved one’s holiday merry and bright! With day passes and memberships, a Jungle Joe’s gift will make a great stocking stuffer! Parents can enjoy comfortable seating, free wifi and food from their delicious cafe. Little Humans Big Fun: Frisco’s newest indoor play area (designed for ages 18 mos – 8 years old) offers interactive STEAM play areas to engage the brain, while providing hours of entertainment and new discoveries at every turn. They offer gift cards, open play passes and pass 10-packs…perfect for gifts! 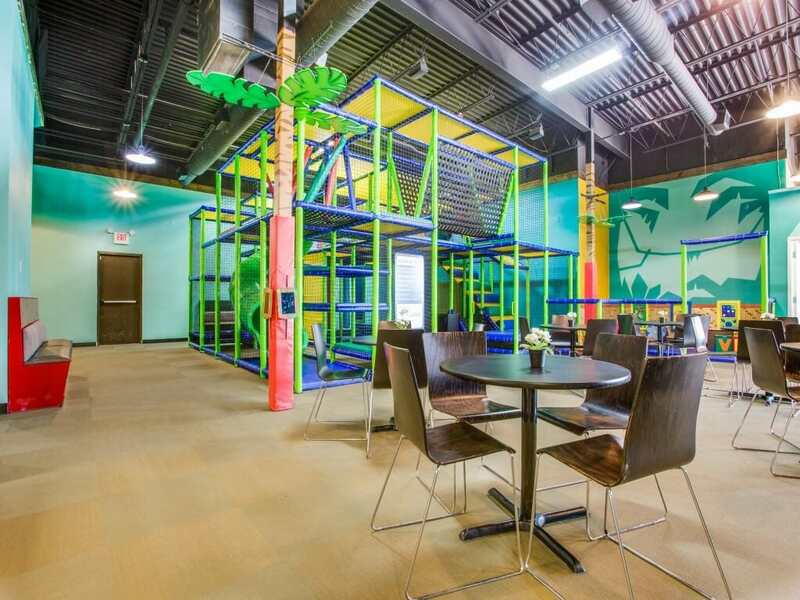 Frisco is loaded with indoor play spaces for older kids as well, such as Pole Position Raceway, Urban Air and Pump It Up. Restaurant gift cards never go out of style, and Frisco is bursting with fantastic ones. Here’s are a few of our favorites spots in Frisco. UP Inspired Kitchen: Chef-driven, fast-casual cafe and coffee house offering honestly sourced breakfast, brunch and lunch and full espresso bar. UP is committed to providing honestly sourced ingredients, with gluten-free and vegan choices, never compromising on flavor. @Nerdvana: Calling all video game nerds and lovers of excellent cuisine! The @Nerdvana team offers two complementary concepts in Frisco: @Nerdvana Food + Spirits and @Nerdvana Coffee + Shop. While the coffee shop will satisfy your cravings for board games and caffeine, @Nerdvana Food + Spirits will appeal to your lovers of video games and really great food. @Nerdvana is on the bottom floor of Gearbox Software’s headquarters on Main Street in Frisco Square. Tavolo Italia: For elegant-meets-casual Italian food, this popular spot in Frisco Square boasts of a sidewalk patio, inviting interior atmosphere and authentic pasta and pizza options. Their extensive wine list is sure to please, as well! Pizzeria Testa: In Frisco Square, Testa is one of the most authentic pizza places in Frisco, where every pizza is hand-made and cooked in imported Italian pizza ovens. The atmosphere is rustic-meets-elegant, and they have three outdoor patios. The Star in Frisco is a major Frisco hot spot right now. Choose from among eight (and growing) dining establishments there, most of which offer patios and a view of Cowboys Plaza (where there always seems to be an event). Sometimes a quick staycation is all one needs to feel rejuvenated. Could someone special in your life benefit from some luxury-laden downtime close to home? Frisco Omni Hotel: Settle in for a long weekend without the hassle of an airport. Frisco’s newest five-star resort hotel includes a rooftop pool (overlooking the Dallas Cowboys’ practice field), high-end retail therapy, and “the Living Room” – a coffee bar by morning, wine bar by night. The Omni offers easy access to the many fantastic restaurants located at The Star in Frisco. Renaissance Legacy West: West Plano’s newest luxury hotel sits just outside of Frisco and is a part of the new urban experience known as Legacy West. With shops, restaurants and modern urban gardens right outside your door, guest will also enjoy a pool, spa, and on-site restaurant. Give the gift of reading! This holiday season, visit childrensbookstore.com through December 11 to purchase past or future favorite books for the kids on your list. Make your selections, enter the code FPLFriends, and know that you’re delivering smiles to the kids while supporting your library at the same time. Thirty percent of purchase prices will be donated to the Friends of Frisco Public Library and will be used to support the programming and resources you value. Frisco Mercantile brings together the finest artisans, collectors, and designers in the area. Shop for antiques, art, collectibles, and more in a unique, boutique setting. With over 200 different dealers, Frisco Mercantile features the trendy, the rustic (think farmhouse style) the homemade, and antiques. The Downtown Merchants of Main Street in Frisco include some our favorite shops who, in many cases, carry highly-sought after, but not easily found boutique brands. To name a few, Lillian Welch, Blue Door, Twisted Simplicity, and Sunny Paige. M&D Sorority Gifts: For the teen girls in your life who have almost everything, how about getting them something to show their pride? M&D supplies affordable Greek sorority merchandise that you just can’t find anywhere else, and they’re here in Frisco! As a Greek Licensed vendor and manufacturer, 8.5% of all sales are given back to the national Greek organization which you purchased products for. Wendistry: For the female fashionistas, Wendistry is a contemporary hand-painted handbag designer with a focus on impeccable craftsmanship and colorful creativity. Shown at New York Fashion Week, each highly curated colorway is a collector’s item and individually SIGNED and NUMBERED as a limited edition piece. This is THE gift for the woman who wants to stand out from the crowd as these handbags are literally a painting in your hand. Stand Up and Paint: Your local, traveling paint studio! Your gift-ee can enjoy painting, crafting, and socializing at one of their many events around town, and a portion of your purchase will go to charity. Crafted: Frisco’s DIY BYOB fun crafting venue offers group events and “make and take” option. Their gift cards are a perfect gift for those looking to create, but who may like a little instruction and wine to go with it! While the rustic, reclaimed wood look has long been a décor favorite with homeowners, more and more people are choosing to not only refurbish old furniture or home decor items, but to personalize those same pieces with special memories or significance. Vitality Bowls: Your gift-ee can boost their vivaciousness with a gift card to this hip and healthy casual restaurant. Vitality Bowls is adamant about avoiding artificial additives of any kind, sourcing only healthy ingredients, and maintaining a menu that is as organic as it is delicious. Frisco Holy Yoga: Frisco Holy Yoga seeks to forge authentic community through Holy Yoga classes, promote physical and spiritual health and well-being and to provide a space to move and breathe in the presence of the Lord. Whether you approach life through a lens of Christian faith or not, you’re welcome at Frisco Holy Yoga. You’ll find challenging yoga classes, a peaceful space and community with fellow yogis. Contact Maureen Beville via Facebook or directly to set up a private session for a loved one or to schedule a group session. BEYOND Studios Pilates: Brand new in Frisco, this innovative, fun, and fresh fitness brand features music-driven workouts in a unique boutique-style studio. They re-mix traditional fitness programs with their BEYOND style to create a memorable and successful experience that is much more than just a workout. With a plan to offer childcare in early 2018, classes here will make a great gift for Moms! Cowboys Fit: Cowboys Fit offers a comprehensive fitness experience with over 60,000 square feet of luxury gym amenities located at the Dallas Cowboys World Headquarters at The Star in Frisco, Texas. There are three fitness studios which host boutique-style classes, yoga, barre, and HIIT (high-intensity interval training) among them. The Ride Room (spinning) features a live DJ spinning high-energy music from a platform while glass doors open up to overlook The Ford Center plaza. A spa, a heated rooftop pool with cabanas, player sightings…and so much more. Memberships and individual class passes are a great gift idea for the Cowboys fan in your life. SkinBasix: Would someone you love enjoy restorative skincare solutions? SkinBasix offer age-management treatments and techniques, including Microcurrent Facial Rejuvenation, Celluma Light Therapy By BioPhotas, Bio-Brasion® Trinity wet/dry microdermabrasion By Bio-Therapeutic and the Osmosis Facial Infusion.